Sepsis, also known as blood poisoning, is the immune system’s overreaction to an infection or injury. Normally our immune system fights infection very well – but sometimes, for reasons unknown, it attacks our body’s own organs and tissues. If not treated rapidly it can result in organ failure and death, however with early diagnosis, it can be treated with antibiotics. Other tests can help determine the type of infection, where it’s located and which body functions have been affected. 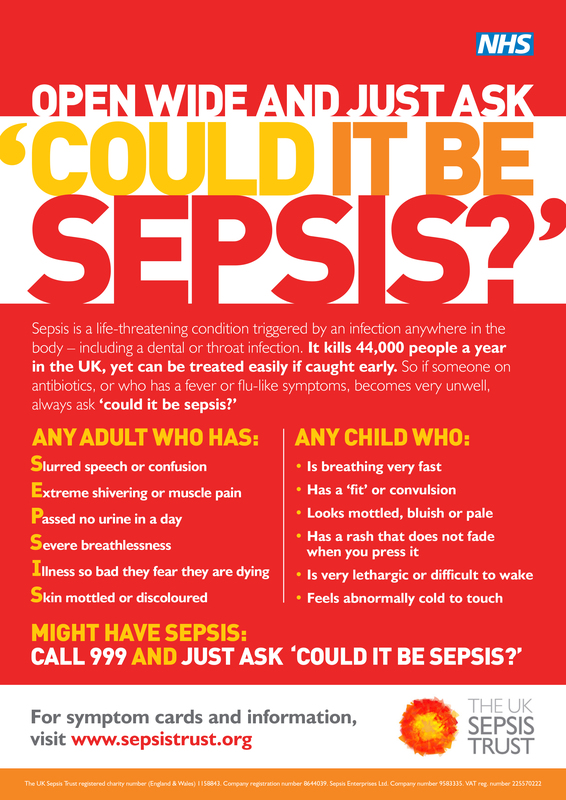 But sepsis is treatable if it’s identified and treated quickly, and in most cases leads to a full recovery with no lasting problems. Click here for more information including videos. Citizen Aid Event Medical Support Shhhh…. Did you know that we are recruiting?